Earlier this month, I stood in front of Frist Campus Center, crying. On any other day I would have been embarrassed. Passersby probably would have been humiliated for me. But on that day, shortly after noon on Dec. 4, it was different. During a 4 1/2-minute moment of silence honoring the lives of Michael Brown, Eric Garner, and countless other black lives, I was surrounded by hundreds of my peers, many also crying, and I knew that I didn’t need to hide my emotion. In that moment, my tears were a form of protest, along with my voice, and my presence. A half hour earlier that day, hundreds of students silently walked out of their classes with their hands raised. Waves of students marched across campus toward Frist Campus Center, voices echoing in the air, meeting others. Hundreds of distinct voices came together to form one unified statement: Black lives matter. I was standing in front of Frist, carrying signs my friends and I had made the night before. I wondered how many students would sacrifice their class time to participate. I did not expect the roar that was coming toward me. This moment was a long time in the making. Princeton is a quiet place. The grandeur of the architecture and the history and tradition it represents can leave many speechless—including its students. 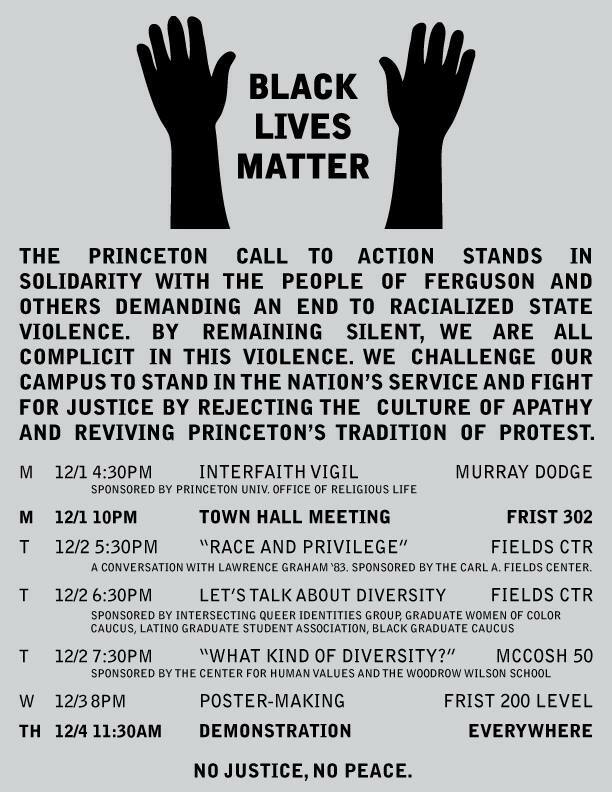 In the three-plus years I have been at Princeton, the Occupy Movement swept cities and college campuses across the nation. Military operations continue in Iraq, Afghanistan, and other foreign nations. Campuses have protested against sexual assault policies, discrimination, investment in unethical industries—the list goes on. There have been rumblings of these movements on campus, but the overwhelming majority of campus has remained silent. Until now. On November 24, the night that the Ferguson grand jury decision was announced, I was packing my bags to go home for Thanksgiving break, until I saw a post on my news feed: “Frist North Lawn. 11:30 PM Tonight. We are marching in Prospect Ave. in protest of the events that transpired in Ferguson. #BlackLivesMatter.” I was shocked. This was a real call to action. Among the outraged, demoralized posts my friends had made, this one asked me to channel my hurt into something real, and to share this hurt with my peers and the institution that shelters us. I thought about practical things like the reading I planned to do that night, or disciplinary policies. And then I thought about the words I had heard Cornel West say to us on this campus just weeks before: “We are more concerned with creating smart people than creating courageous people.” I knew what I had to do. I hurriedly texted a few of my friends, and we, along with hundreds of our peers, headed toward the student center. Over the course of the last few weeks, I have joined my peers in chanting across campus, participating in planning meetings, sitting before University administrators, and marching through New York City, and I have never felt more confused or frustrated about my own role and identity. This is not my movement. I am not black. I do not experience the brutalities that black Americans are forced to endure. I am not systematically discounted, oppressed, and silenced. It is not appropriate for me to chant “I can’t breathe,” or stand in front of my black peers. I have never been more aware of my abilities and my limitations. And for the first time in my Princeton career, I am not supposed to have the answers. It’s a different kind of learning. I may be confused and hesitant, and I may misstep. But out of these moments, I have learned more about myself, and I have learned more from my peers than I have in a classroom. The classroom doesn’t teach empathy, restraint, or courage. Instead, I have looked toward my peers for inspiration and guidance, peers who are selflessly reaching out to the community, planning protests, and drafting letters and op-eds until 2 a.m., on top of their schoolwork. Although I have only been at Princeton for a little over three years, I know that what is happening now is new and remarkable. I firmly believe that we are in a pivotal moment where we should think critically about Princeton’s mission and impact on the world. At Princeton, we are privileged to be surrounded by knowledge, resources, and opportunities— just a look around this blog can tell you that. Yet perhaps the question at hand is not whether or not we have these resources, but rather, what we are doing with them. More and more, I see my fellow peers asking these uncomfortable questions. We are trying to act in the nation’s service. In the “Orange Bubble,” Princeton teaches us to be smart. We are teaching ourselves to be courageous. For more information on recent protests and organizing, please follow @Ferguson_PU on Twitter.